10Bet are one of the first, early entrants to the online sports betting scene, having started their offering back in 2003, as one of the earliest operators on the internet. They now offer a whopping 60,000 games to place your bets on per month, which makes for a very diverse offering. Their live betting offering is also huge, with up to 25,000 events a month to choose from. They cover more than 50 sports in over 2,000 betting markets, a huge number. Their claim to fame is that they are sponsors of Blackburn Rovers F.C. In addition to their extensive sportsbook, 10Bet also offer a live betting, casino games, slot games, a live casino experience (with real dealers) and virtual sports. If you enjoy a punt or a gamble, this makes it a great destination. 10Bet’s welcome promotion bonus is one of the best currently available on the sports betting market, and certainly worth investigating. On making your initial deposit as a new customer, 10Bet will match it up by 50%. So, if you put in £100, they will put in £50, for example. You can claim up to £100 with this matched deposit welcome bonus, and that is easily one of the most generous around. 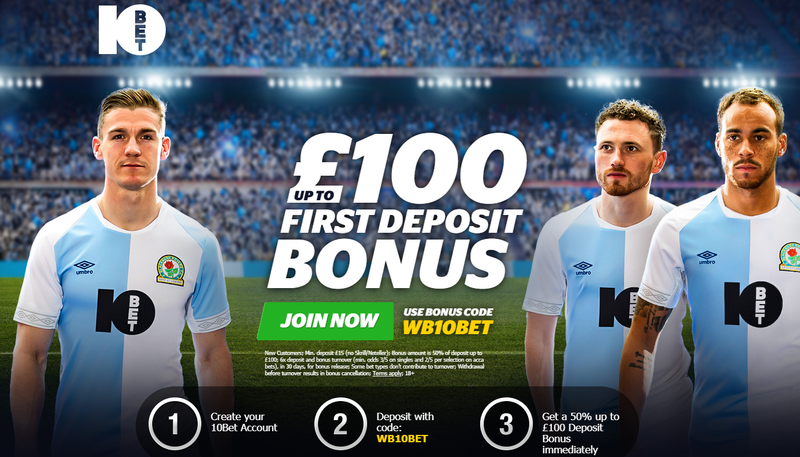 In addition to their main new customer welcome offer, 10Bet, like all other major betting houses, offer a range of other enticements to keep you coming back. One of these is the Live Free Bet Club, which allows you to get a free £10 bet each week, if you place 5 in-lay bets in a 7 day period. Another is the Acca Boost, which lets you enjoy up to 60% in enhanced winnings on doubles, trebles and accas. There are a host of other special offer promotions, which change regularly. Obviously, terms and conditions apply to all of these, so it’s important to check the official site for further details. To claim this, you simply need to hit the ‘Play Now’ button on this page, or the 10bet logo, to be redirected to the official site. 10Bet covers a wide variety of betting markets in different sports, countries, leagues and events. Sports covered include Football, Tennis, Basketball, Cricket, ESports, Golf, Handball, Rugby League, Volleyball, Water Polo, MMA, Snooker, Table Tennis, Darts, and many more. In the sport of football alone you can bet on league and cup games in Sweden, Chile, Norway, Romania, Poland, Portugal, Germany, Hungary, Austria, Bulgaria, Czech Republic and many, many more countries, which goes some way to illustrate just how comprehensive 10bBet’s sportsbook offering is. There are also a host of different bet types available as part of the 10bet offering. Just in the area of football for example, you can bet on total goals, both teams to score, match winner, double chance, total team goals, exact score, winning margin, and many, many more betting permutations. These will vary from game to game, so it’s best to study the odds and the forms of the various teams and players. 10Bet thankfully have their own mobile app, so if you wish, you can download this in the Google Play Store, or Apple’s App store, depending on what type of phone you have. Don’t forget to go ahead and sign up first, to claim your welcome bonus. We have to conclude our 10Bet review by saying it’s easily one of the better sportsbooks on the market. With an excellent user interface, on desktop, mobile and tablet, an exceptional range of sports markets and betting types covered, and good in play betting, you have all the reason you need to sign up. The welcome bonus is exceptional, and all avid bettors should have an account with this company.